Psychopathology at School provides a timely response to concerns about the rising numbers of children whose behaviour is recognised and understood as a medicalised condition, rather than simply as poor behaviour caused by other factors. It is the first scholarly analysis of psychopathology which draws on the philosophers Foucault, Deleuze, Guattari and Arendt to examine the processes whereby children’s behaviour is pathologised. The heightened attention to mental disorders is contrasted with education practices in the early and mid-to-late twentieth century, and the emergence of a new conceptualization of childhood is explored. Taking education as a central component to the contemporary experience of growing up, the book charts the ways in which mental disorders have become commonplace in childhood and youth, from birth through to college and university, but also offers examples of where professionals have refused to pathologise children’s behaviour. The book examines the extent of the influence of psychopathology on the lives of children and young people, as well as the practices that infiltrate education and the possibilities for alternative educational responses that negate the diagnosis of mental disorder. 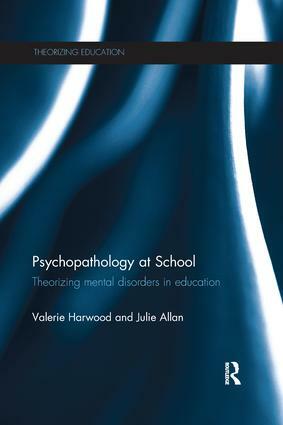 Psychopathology at School is a must read for anyone concerned about the growing influence of psychopathology in education and will be of particular interest to educated readers and to scholars, students and professionals in education, psychiatry, psychology, child studies, youth studies, nursing, social work and sociology.